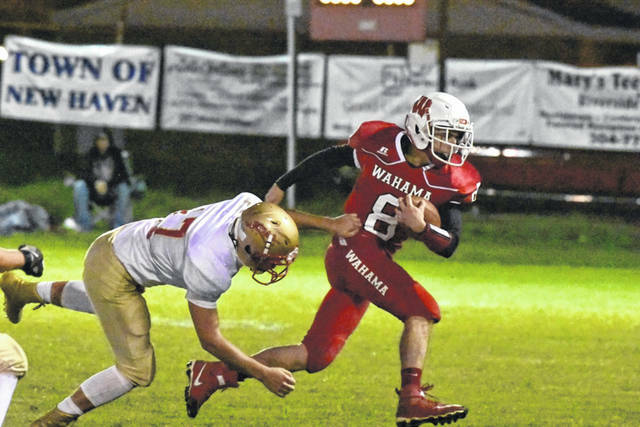 Wahama quarterback Abrahm Pauley (8) eludes a South Gallia defender during Friday night’s Week 8 TVC Hocking contest at Bachtel Stadium in Mason, W.Va. It took about a half to shake off two weeks of rust, but Point Pleasant made a victorious return to the gridiron on Friday night during a 55-13 decision at Meigs. The Marauders led 7-0 five minutes into regulation, but the Big Blacks (6-0) countered with 20 consecutive points en route to building a 13-point cushion at the break. PPHS increased its lead to 48-13 through three quarters and ultimately rolled to the 42-point outcome. Wahama (1-7) had its Homecoming festivities ruined after suffering a 42-20 setback to visiting South Gallia in a Tri-Valley Conference Hocking Division contest at Bachtel Stadium. The White Falcons trailed 22-6 at halftime and never managed to get back within striking distance as the Rebels went on a 20-14 second half run to wrap up the 22-point triumph. Hannan also fell on Friday night after dropping a 50-13 decision at Montcalm. Hannan will host Buffalo next Friday in a non-conference contest at 7 p.m. The Big Blacks return to action Friday night when they travel to Man for a 7:30 p.m. kickoff. Wahama has a bye week in Week 9 and returns to action Friday, Oct. 26, when it travels to Trimble for a TVC Hocking contest at 7:30 p.m.
Due to an early deadline, the Mason County football games from Week 8 will be available in the Tuesday sports edition of the Point Pleasant Register. The game stories will be available online at mydailyregister.com before appearing in print.